Your kid can grow up to be whatever he or she wants - a doctor, a newscaster, a Nascar pit crew member, it doesn't matter because you're a devoted parent. The only thing that would shake your unconditional love for your child and feel you've failed as a parent is if they don't love bacon as much as you do. Encourage them down the right road with bacon shorts. On the front of the wrapper you'll see the title - "BACON BITS"
One of the distinguishing features between my adult boxers and my kids' boxers is the lack of a functional fly. What's the point? They're babies. The shorts are sized to be worn over a diaper, it's too early to expect them to take responsibility for their own bodily functions. I make all of my products in a smoke-free home, I only use woven 100% quilter's quality cottons, I prewash all fabrics before I cut so the finished garment stays true-to-size, and all interior seams are finished by serging. 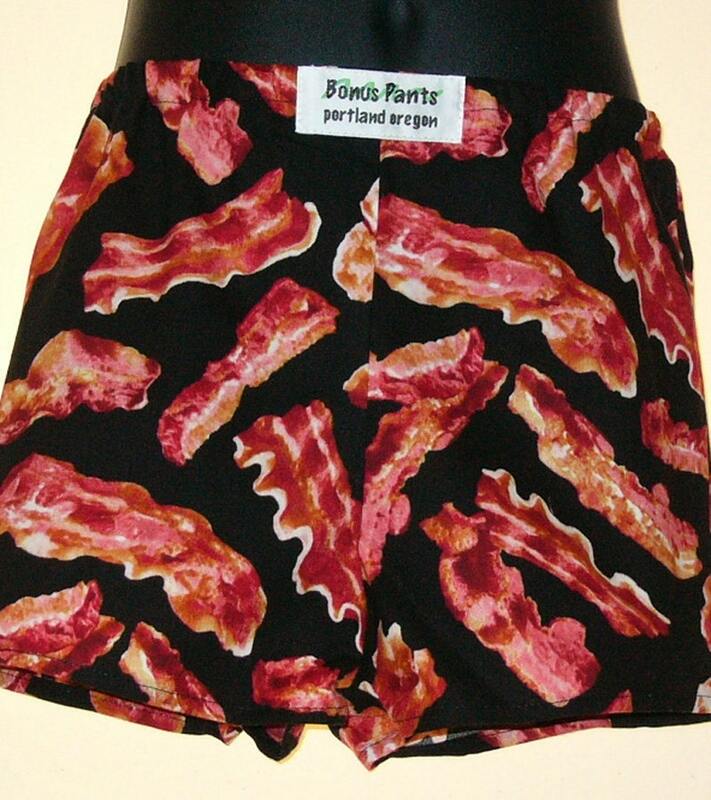 These are some quality shorts... and everything (including clothing) *is* better with bacon. I love it. I love it. I love it. MEOW. Great conversation starter with that special someone. Quick shipping, true to size and great quality!